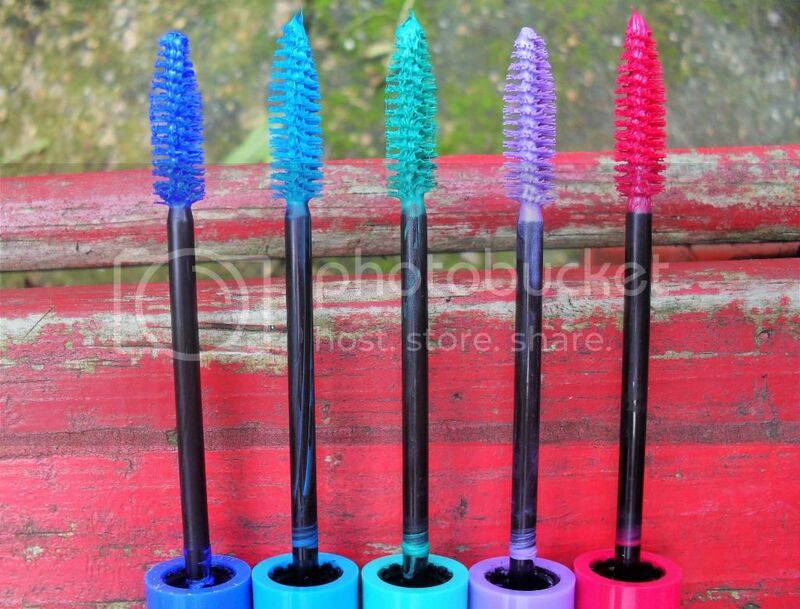 Every summer we see bright coloured make up ranges coming out and in particular coloured mascara! But at prices like £14 from Ciaté for coloured mascara which is a risqué product... I think cheaper alternatives are a must! I love a pop of colour and the concept of coloured mascaras amazes me and luckily these were given to me at the Essence Event so here is a complete range of coloured mascaras from Essence which you can get in Wilkinson for £3 each. There are 5 Shades available and they are, Petrol (02), Bright Blue (04), Emerald Green (01), Purple (05) and Pink (03). I've written them in the order of the photo so that there is no confusion! I know you are probably thinking that these are not wearable, however I believe you can wear it on just your bottom lashes to bring attention to the eyes or if your brave just full on colour! The darkest blue is probably your best bet! So here i'll show you swatches of each shade but in numerical order! These are my natural lashes and I have NOT used an eyelash curler as a fair test to all my mascara reviews. This Emerald Green shade is not what I saw the mascara. I was expecting a sort of a green turquoise just from looking at the bottle, however I am pleasantly surprised! I actually think despite how shocking this may look I actually think this may be very wearable. Maybe I'm insane but I really do love this and I think this may even be a dupe of the Ciaté - Nymph Mascara which retails for £14. No word of a lie I desperately wanted it because I hadn't seen that shade of coloured mascara done before! You can't imagine how glad I am that I didn't have to fork out £14! This Dark Blue/ Navy shade called Petrol is the most wearable shade in the whole collection. And the shade that you can wear all year round, especially as we are going into the A/W Season this mascara would fit right in! I personally love this shade as it looks almost (well) and I think it makes brown eyes look amazing! My sister who mind you is older than me bought one of her own after seeing it and incorporated it into her makeup bag. So I've seen first hand that it lasts all day and does not flake so for £3 it is a huge bargain!! This is probably the least wearable shade in the whole range as I find that I like/hate it. I think this would only be great as costume/festival makeup for someone with maybe green or blue eyes or maybe even a darker skin tone. But personally I find that I look like I have an eye infection or as if my eyes have been irritated. I think this is just going to be used as costume makeup for me or on my hair. This lovely appropriately named Bright Blue Shade is a shocking electric looking colour. Personally I fond it most wearable on the bottom lashes and I really like it because as a glasses user I find that it helps my eyes stand out behind my glasses. Again I find that this shade helps brunette eyes stand out on a beautiful way and I will probably be using this frequently when I feel like I want a strong flash of colour! Now this is another extremely un-wearable shade if not worse than the Pink, but yet I absolutely love it. I know I'm insane but I just love how frosty it looks! I feel like this would be amazing for Halloween or a festival! Or even an extreme winter look, or a harujuku style.... okay I'm not sure how you could wear this and not look a bit strange. But the most wearable way would be on the ends of your eyelashes as if snowflakes had fallen on them! 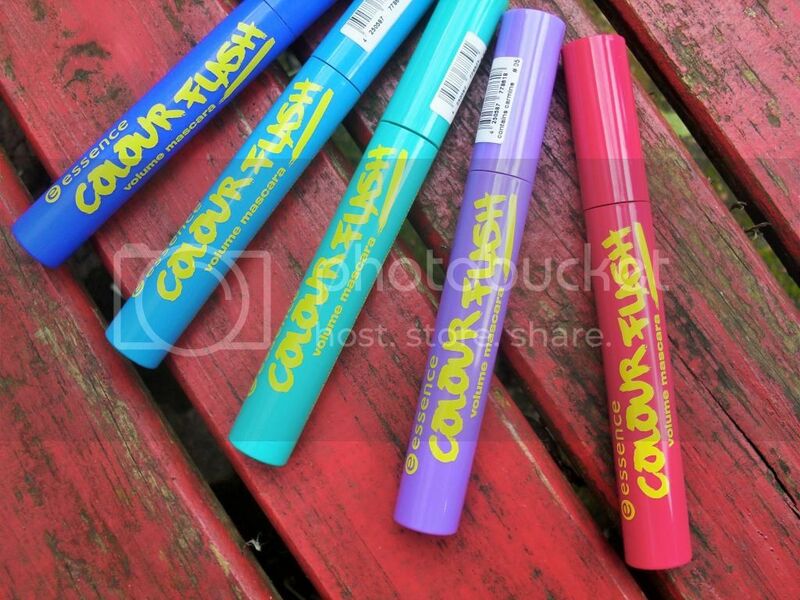 Another reason why I like this is because I actually haven't seen this colour mascara before. EVER. So I can't wait to experiment and see if I can try and make this as wearable as possible! Overall I am a big fan of this range due to the two extra colours that aren't usually available by budget brands and I find that compared to the MUA Coloured Mascaras (which I've reviewed before) paying £2 more does make a difference as I found that my eyelashes were more spread out (not as clumpy). What I will say is it dries quickly so you do have to be a bit quick when applying them. Again like any other mascara as I have Dark Brown/Black Eyelashes I did need to add a couple of coats for maximum colour, but it does not flake at all which I LOVE. So are there any here you would use? What other brands would you recommend? Thank you so much!! That is such a compliment! And same usually coloured mascaras focus on the colour and not on the quality of the mascara!